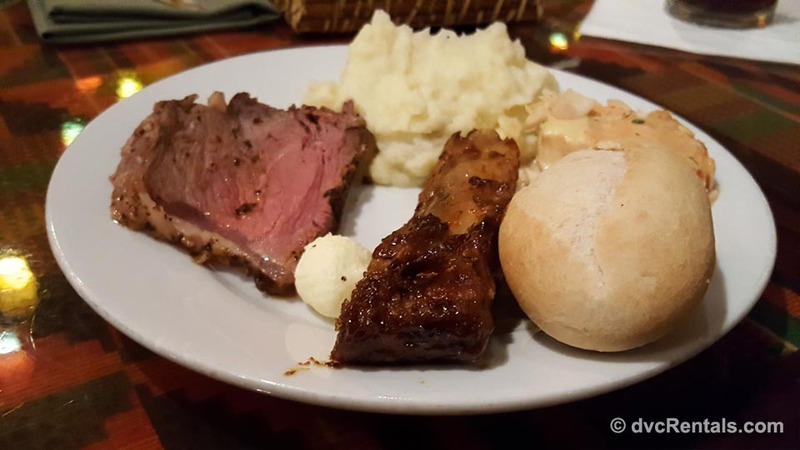 If you like a variety of food and plenty of it, Boma is the place for you! 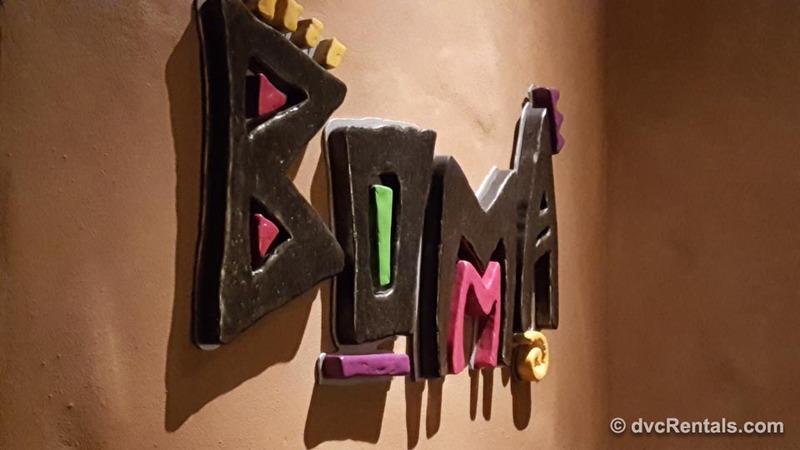 Located in Jambo House at Disney’s Animal Kingdom Lodge, Boma is a culinary adventure in an authentic African atmosphere. 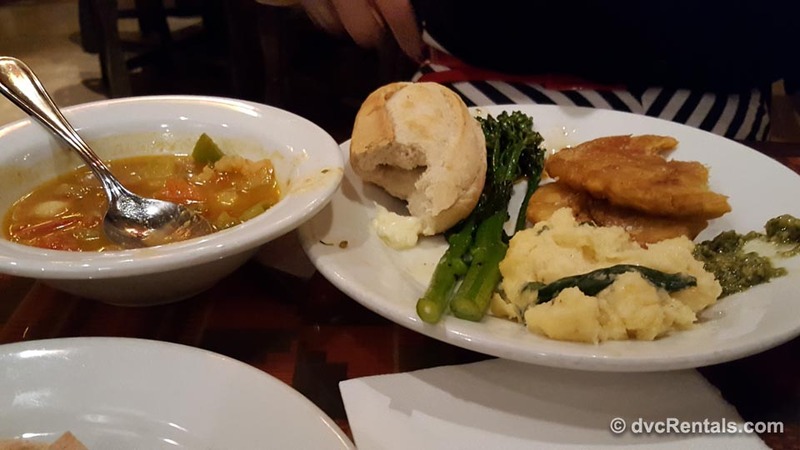 What’s especially nice is here is a place for those with “daring” appetites as well as those who enjoy more traditional fare; Boma combines both. 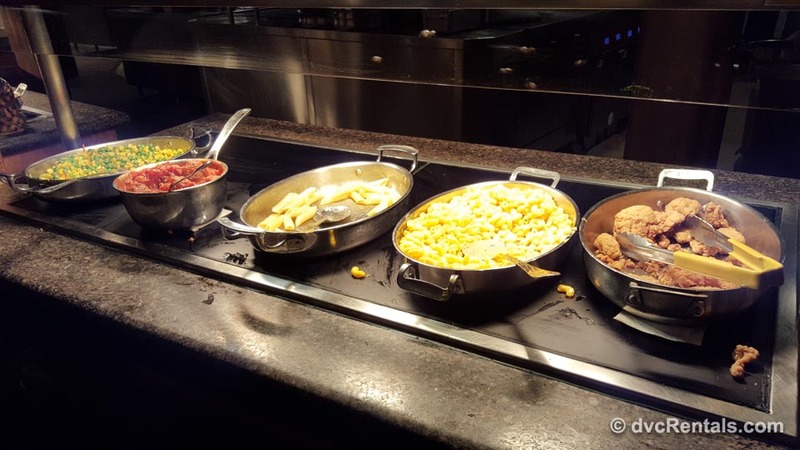 The restaurant serves both a breakfast and dinner buffet (no lunch), but as I have only experienced the dinner that will be the focus of this blog. There were three in my party, my two daughters and myself. We were celebrating one of my daughter’s birthday. We arrived about 10 minutes before our reservation, and were warmly greeted when we checked in at the podium. They texted us in less than 5 minutes, letting us know our table was ready. There is a distinct African theme and “feel” at Boma. The cast members are dressed in African garb, which varied depending on the role they were playing. One thing they had in common was the dark colors of all the costumes. The décor in general is rather muted, and I don’t mean that in a bad way. I love the bright colors found in most of Walt Disney World, but it’s nice to try something a bit more understated on occasion. Not to say that the place itself is quiet, quite the contrary. The place is literally jumping, since it is a buffet, so guests are constantly getting up to refill their plates. However I’m happy to say that the tables are spaced nicely apart, so you won’t have to fight through any to get to the buffet area. Once there, the line at the buffet moves quickly. 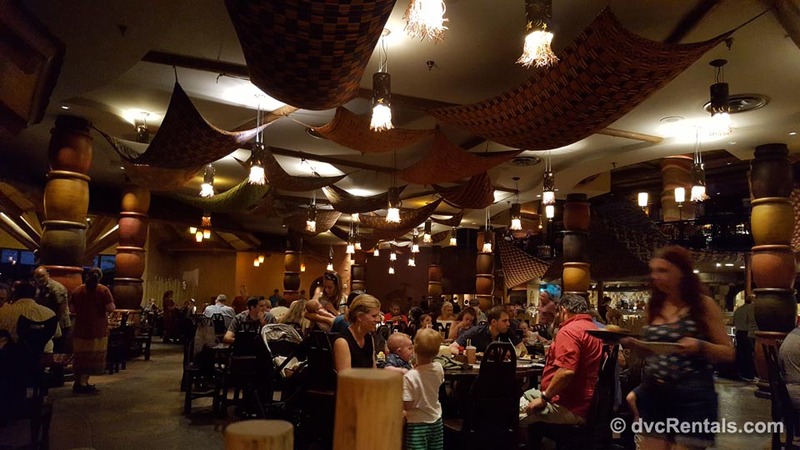 Boma, in spite of the movement of guests, never felt overly loud or chaotic to me or my daughters. When you are seated your server will come over and take your drink order. While you’re waiting I suggest you check out the different African patterns woven into the tablecloth, and the neat salt and pepper shakers that fit right in with the theme. Then look around the restaurant and check out all the awesome details. Depending on where you’re seated there will may be African works of art to view. One spot in the restaurant has carved sculptures of a lion, an elephant and a panther. Even the lighting adds to the vibe; when you are at Boma you truly feel transported to a unique place. Your server will take your drink order (most soft drinks are included in the cost, other drinks are an additional charge) and explain the layout of the restaurant. There are a number of stations, each with a certain type of food. There is no particular order that I could see (for example, the breads, rolls and salads were next to the desserts), but there sure is plenty to choose from. 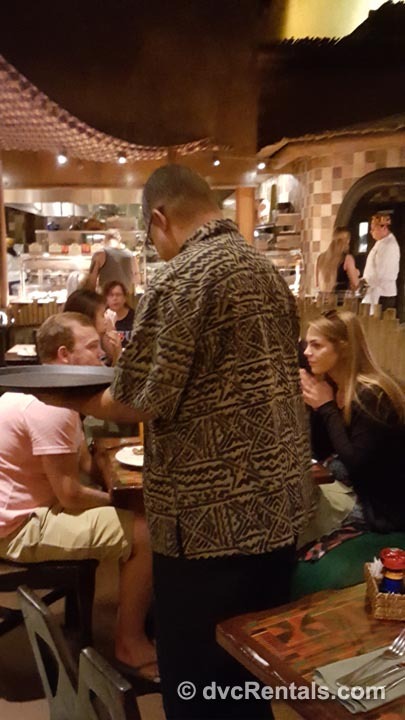 Boma boasts 75 different varieties of food at dinner, however the specific foods can vary from visit to visit. There are a number of food stations at the buffet that will include: Fish; Carved Meat/Ribs; Potatoes; a variety of salads (including pasta-type salads); rolls and flatbreads with accompaniments (such as hummus and other dips, along with regular butter); fruit with yogurt sauce; a number of soup choices (I adore the ginger carrot); a veggie station (as an aside, this is a great choice for a family whose members vary in what kind of foods they like—there truly is something for everyone); a variety of grains (such as basmati rice and different varieties of couscous); a kids section (but adults are welcome to enjoy as well) with mixed veggies, chicken fingers, macaroni & cheese, and French fries. Then there’s my favorite station of all, the awesome desserts! 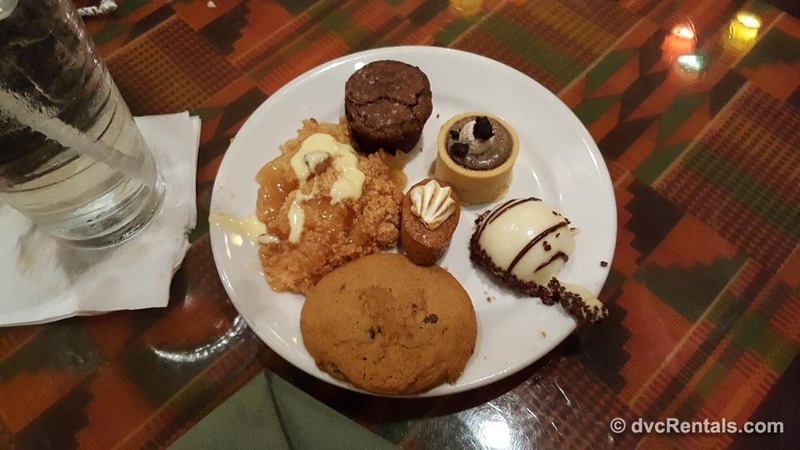 A very popular dessert choice are the Zebra Domes, often raved about on Walt Disney World internet forums. These have a warning sign displayed over them reading “may contain alcohol”. Zebra domes are a thin layer of white cake with a coating of white chocolate ganache sprinkled with dark chocolate ganache. In between the cake and the white chocolate ganache coating is Amarula Liquor mousse. However try not to gorge on too many of the zebra domes, however delicious they may be. There are huge cookies, super-duper brownies with a pecan mousse topping, mini cupcakes, warm apple cobbler, and more. 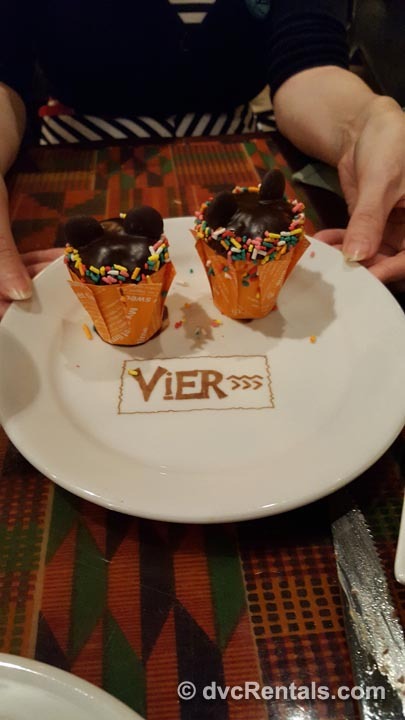 Because it was my daughter’s birthday and Mother’s Day was a couple of days away, our server surprised us with two yummy cupcakes with dark chocolate Mickey ears. Gotta love those magical moments, I had no idea he was going to do that. 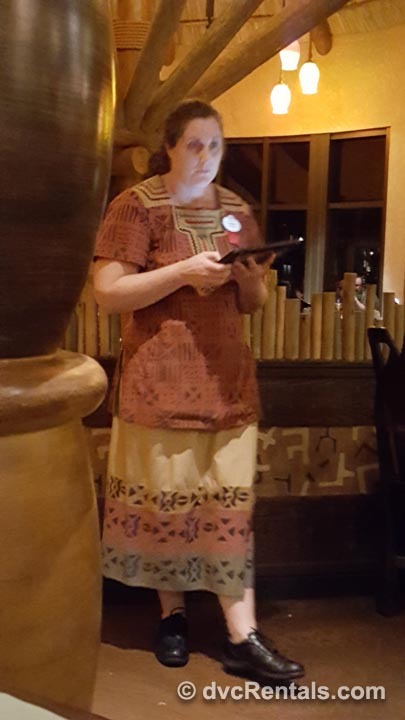 I suggest you pace yourself when you visit Boma. There is SO MUCH food; you’ll never be able to eat it all. But if you take your time and rest between portions you’ll be able to try more things and (hopefully) not leave feeling like you’re going to burst. It’s a good idea to scope out the choices before you put anything on your plate. 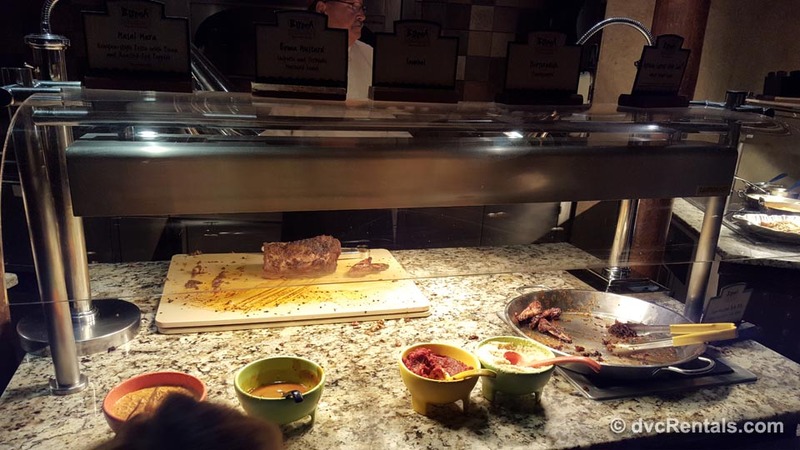 Although you can go up to the buffet as many times as you like, there is just so much room you have in your stomach. So walk the buffet line without getting anything the first time. Look and see what appeals most to you, and then go back to get a tray and plate and get small tastes of the things that you think you’ll like. If you stick to small portions the first round, you’ll know what you want larger portions of the second visit to the buffet table. And the third, fourth, fifth, etc. visit, depending on your appetite. And again, leave room for dessert! Dinner is served from 5:00-9:30 PM and the current cost for adults is $43, for kids 3-9 it’s $14. Tax is included in that cost, but gratuity is not. 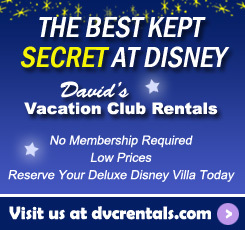 The prices can vary during holidays and other very busy times of the year. 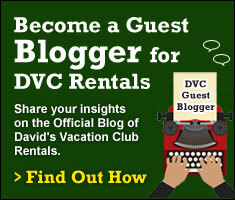 There is a 10% discount for DVC Members and Disney Visa Cardholders, and a 20% discount for Tables in Wonderland. It is one table credit for those who are on the Disney Dining Plan. Advance reservations are strongly suggested, this is a very popular eatery. If you drive to the resort follow the signs to Jambo house and self-park, at no charge, or if you prefer, you can pay to valet park. To get to Animal Kingdom Lodge without a car you either can take a taxi or use any of the theme parks as a “hub”. Take the bus to Animal King Lodge/Jambo House. If you opt to do the latter make sure to return to the theme park before it closes to retrieve your car. 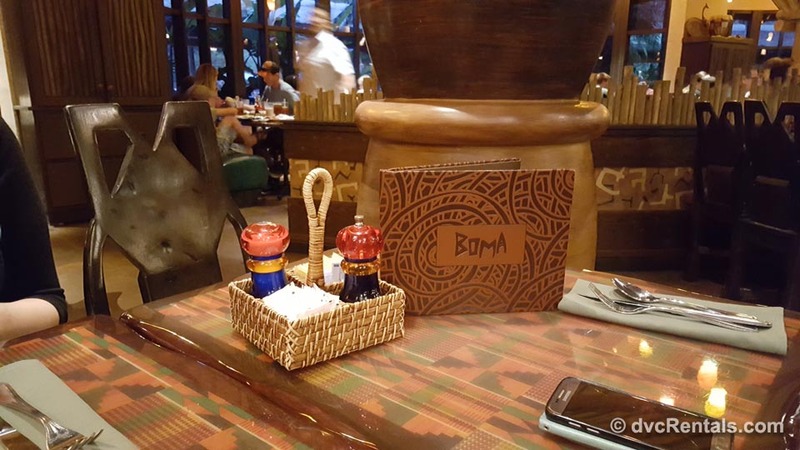 3 thoughts on "Boma – Flavors of Africa"